Note: You must have Administrative rights on the computer to install SSMSE. Step 1: For 32-bit platforms, download and install the 32-bit version of Microsoft .NET Framework 2.0. For 64-bit platforms (x64 and EMT64 only), download and install the 64-bit version of Microsoft .NET Framework 2.0. Note: If you have already installed SQL Server 2005 or Visual Studio 2005, you already have Microsoft .NET Framework 2.0. Step 2: Download and install Microsoft Core XML Services (MSXML) 6.0. Note: If you have already installed SQL Server 2005, you already have MSXML 6.0. Step 3: Download SSMSE by clicking the SQLServer20xx_SSMSEE.msi link later on this page. To start the installation immediately, click Run. To install SSMSE at a later time, click Save. Step 4: Follow the installation instructions provided in the Readme (SSMSE 2005), Readme (SSMSE 2008) or Readme (SSMSE 2012). By default the PrintManager database created on a SQL server, will have the same default permissions as other databases on that SQL Server. In most cases, users within the network that are full Administrators of the SQL Server, will also have full control of the Print Manager Plus database. Below is each database type, and the recommended tool for setting permissions. 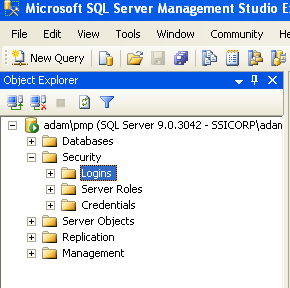 SQL Server 7.0/2000: Database permissions should be configured using the SQL Enterprise Manager. This will allow you to specify which Active Directory accounts can access the PrintManager database. SQL Server 2005: This version of SQL comes with the SQL Server Management Studio. This will allow you to specify which Active Directory accounts can access the PrintManager database. MSDE/SQL Server (2005/8/12) Express: These free versions of SQL from Microsoft do not come with a built in tool for managing permissions. However the SQL Server Management Studio Express can be used to manage these, and any of the previously mentioned versions of SQL. These express versions can be downloaded at the Microsoft Download Center at http://www.microsoft.com/downloads. Since the Management Studio Express mentioned above is capable of setting permissions on any SQL Database supported by Print Manager Plus (SQL 7.0/2000/2005/2008/2012/MSDE), we have provided basic steps for setting permissions on the Print Manager Plus database. 1. Open the SQL Management Studio Express. 2. Connect to your server. 5. A new dialog will appear, click Search... and choose the Account or Group you want to grant permissions to the Print Manager Plus database. 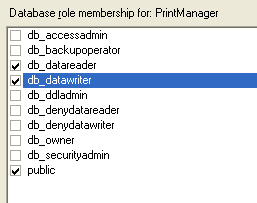 Then further down make sure Default database:,Default language: are set to PrintManager and English. 6. Once that user or group is found and selected, click [User Mapping] in the left pane. 7. Select the Check box for the database named PrintManager. 8. 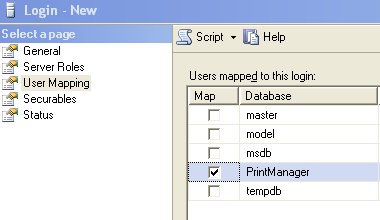 Once the PrintManager database has been selected, within the lower pane you will see more specific permissions. For most functions, you should grant the account db_datareader, db_datawriter and db_public (by default the last option db_public is already checked). 9. Click OK once the desired permissions have been set. This will cover the general permissions required for Print Manager Plus. Counting Engine - Copies track as extra pages instead of copies.